This is the beginning of your journey into overhead diving. Cavern certification further expands the Open Water Divers ability to safely enjoy our Florida Springs. Completion of this course allows limited penetration into the cavern zone. This course covers proper buoyancy, trim, propulsion techniques, reel use, light use, team awareness, and other skills necessary to diving safely in the overhead. The cavern diving course is taught in a minimum of two days and includes classroom lectures, field exercises, open water line drills and a minimum of four cavern dives. 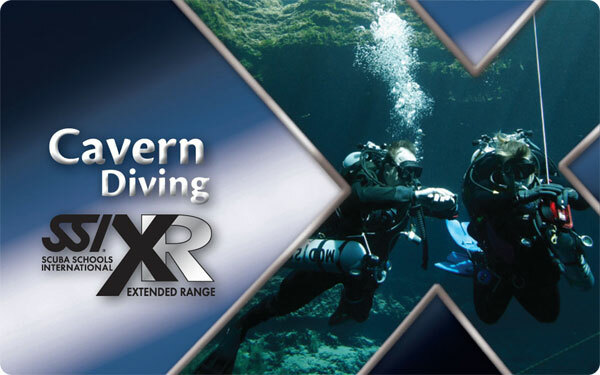 This course emphasizes planning, procedures, environment, propulsion techniques, buoyancy skills, problem solving, equipment modification and the focuses on the specialized needs of the cavern diver.